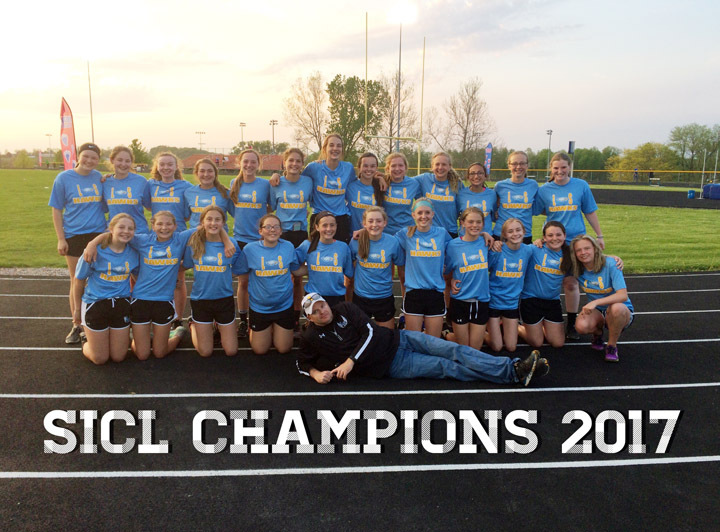 Going out with a bang, the Lynnville-Sully junior high girls won the SICL Conference meet to conclude the season last Tuesday, May 9. The Hawks performed well at the meet at BGM. Eighth-grader Korinne Jansen had a stand-out night in her last junior high meet. She won both the 100-m dash and the shot put and placed second in the 200-m dash. Her classmate Cayler Noun-Harder won the long jump. Second-place individual finishes went to seventh-grader Sydney Jansen with a personal best in the 200-m hurdles, eighth-grader Megan Van Zante in the 1500-m dash, and eighth-grader Meleisha Vos with a personal best in the 800-m run. Vos also placed in the 1500-m run, taking fourth. Eighth-grader Caitlin Alberts finished third and Noun-Harder was just behind in fourth in a very competitive 400-m run. In the relays, the 4x100 team of S. Jansen, eighth-graders Briley Riedlinger, Riley Terlouw, and K. Jansen just edged out a fast HLV team to place first. The 4x200 team of seventh-grader Reagan McFarland, eighth-grader Krystal Van Dyke, Riedlinger, and Terlouw also took home first place. The 4x400 team of Van Zante, eighth-grader Cally Gibbs, Noun-Harder, and Alberts ended the night with a strong first-place finish. 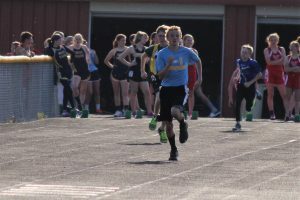 The junior high boys also wrapped up the season at the SICL meet last Tuesday. They finished with 35 points for 10th place ahead of Colfax-Mingo and Tri-County. Mason Jansen rounds the track at the SICL meet. The top performances for L-S came from the 4x100 and 4x800 teams with both placing third. 4x100 teammates were eighth-graders Lane Mathis, Malichi Foster, and Payton Van Wyk and seventh-grader Mason Rodibaugh. 4x800 runners were eighth-graders Aiden LeCompte and seventh-graders Owen Norrish, Brodey Johnson, and Parker Van Wyk. The Hawks also did well in the shot put with Mathis and Payton Van Wyk placing third and sixth respectively. Other points were earned by Mathis in the 100-m dash (seventh); eighth-grader Mason Jansen in the 800-m run (fifth), 100-m hurdles (sixth), and long jump (seventh); eighth-grader Blake Rea in the 200-m hurdles (eighth); and the shuttle hurdle relay team of eighth-grader Dakota Seastrom, Foster, seventh-grader Ryan Annee, and Rea (seventh). Celebrating the winning of the SICL title are members of the L-S girls track team with L-S Coach Kevin Johnson in front, from left, kneeling: Lily Zylstra, Megan Van Zante, Dakotah Bokhoven, Haley Mathis, Cayler Noun-Harder, Denali Conover, Cally Gibbs, Reagan McFarland, Sydney Jansen, Brooke Maston, Nevaeh Hellickson; back: Hadley Tice, Briley Riedlinger, Riley Terlouw, Aliya James, Caitlin Alberts, Aysia Vander Linden, Krystal Van Dyke, Jaden Brand, Elizabeth Squires, Korinne Jansen, Bryar Hill, Meleisha Vos, and Laci Keen.